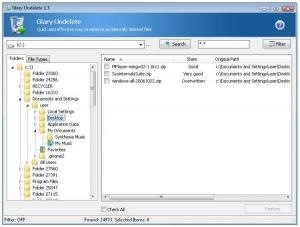 Glary Undelete is a free and easy-to-use yet powerful file undelete solution for FAT and NTFS file systems. Glary Undelete will bring back files emptied from the Recycle Bin, in a DOS window, from Windows Explorer with the SHIFT key held down. Glary Undelete will even recover files that have been deleted by bugs, crashes and viruses! Glary Undelete works under all Windows systems. The program supports all Windows file systems for hard and floppy drives including FAT12/16/32,NTFS/NTFS5 and image recovery from CompactFlash, SmartMedia, MultiMedia and Secure Digital cards.